Niagara Falls is a wondrous place due to the astounding power and beauty of its three waterfalls. However, not many visitors understand just how one-of-a-kind the Falls are and how much the northeast relies on them. To inform your next trip to Niagara Falls, here are 7 fantastic facts about our incredible natural wonder. Though in reality Niagara Falls is comprised of three separate waterfalls, Horseshoe Falls in Canada and American Falls and Bridal Veil Falls in the U.S., all three Falls’ combined boast a flow rate of more than six million cubic feet per minute, which is more than any other waterfall on Earth. 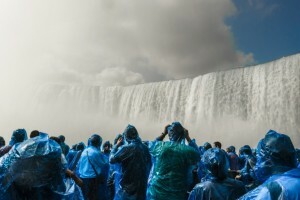 However, Horseshoe Falls alone is the most powerful and tallest waterfall in North America. Though the place is called Goat Island, the small tract of land between the American and Canadian Falls doesn’t actually contain any goats. At one time, before Goat Island was added to New York’s Niagara State Park, entrepreneurs argued over what the land could be used for; P. T. Barnum heavily campaigned for the island to be used as a permanent circus grounds. 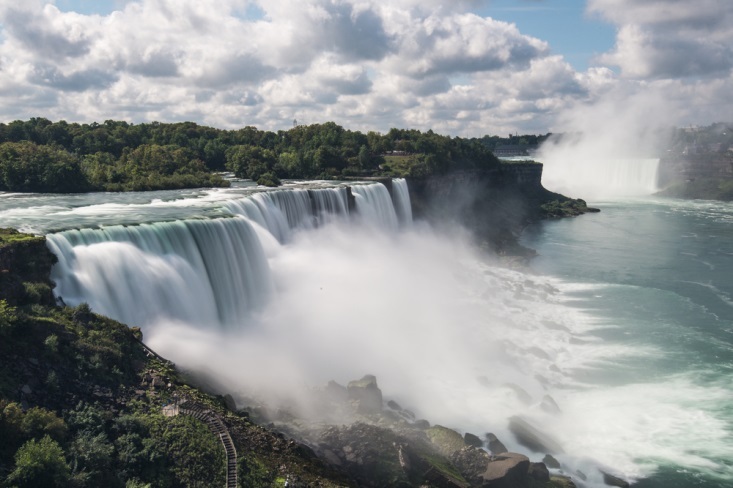 More than 12,000 years ago, when water first started careening off the Niagara Escarpment, the Falls were situated seven miles downriver, in what is present-day Lewiston, New York and Queenston, Ontario. Due to efforts to conserve the Falls, they are now eroding slower, with Horseshoe Falls losing less than 12 inches every year and the American Falls down to three to four inches every 10 years. Streams and rivers throughout the countryside empty their water into Lake Superior. From there, the fresh water travels through Lake Huron and Lake Eerie, which channel into the Niagara River. After speeding over the Niagara Escarpment in the Falls, water travels to Lake Ontario, and finally out to the Atlantic Ocean through the St. Lawrence River. In an attempt to balance residential water and energy needs and preservation of the waterfalls’ natural beauty, Canada and the U.S. struck up the 1950 Niagara Treaty, which states that during daylight hours between April 1 and October 31 (high tourist season), the Falls’ flow rate should never fall below 100,000 cubic feet per second. The revenue gained by local businesses from so many tourists allows the Canadian province of Ontario and the American state of New York to fund public works projects, like infrastructure maintenance and better schools. A 63-year-old school teacher named Annie Edison Taylor decided to attempt the trip in a wooden barrel padded by a thin mattress. Though she hoped to gain fame and fortune with the feat, Taylor never did garner much wealth, and is often quoted as saying “I would sooner walk up to the mouth of a cannon, knowing it was going to blow me to pieces than make another trip over the Falls.” Still, others have unfortunately attempted the trick throughout the intervening century in varying levels of success and failure.